On Saturday, March 26th, 2011, Cage Fight 7 became the first ever regional mma event to be televised live in Pennsylvania and Scranton MMA fighters were among the highlights of the night! Scranton MMA continued to exhibit why we are northeast Pennsylvania’s premier mixed martial arts academy by sending into the cage three of its brightest stars, Richie Gates, Gary Peters, and James Cianci. The night started for the Scranton MMA crew with ”The Ginger Ninja” Richie Gates (3-0) stepping into the cage to face veteran fighter Phil Parrish (10-2). This bout was a war from bell to bell and had the crowd on its feet at several points of the fight. In the course of the contest the heated exchanges of punches and kicks and the fast paced ground scrambles had the crowd ooo-ing and awe-ing! Parrish employed a classic “sprawl and brawl” gameplan to counter the superior wrestling and Gracie Jiu Jitsu skills of Gates that in the end won him a unanimous decision over Gates. While dejected over the loss, Gates had nothing to hang his head over. “The Ginger Ninja” stepped in against a far more experienced opponent than himself and gave the game Parrish everything he could handle. Gary Peters (3-2) was next into the cage to face Wayne Jurus (3-0) and right from the opening bell the crowd new to be ready for fireworks. After a brief feeling out process, Jurus landed a straight left cross connecting with Peters jaw and sending him reeling to the mat. The crowd roared but Peters rebounded straight back to his feet and returned fire forcing Jurus’ back to the cage. From the clinch against the cage Peters dropped levels to secure a double leg and hoisted Jurus’ into the air and pounded him to the mat with a thunderous double leg! The round ended with Peters working towards an armbar and Jurus defending. The next 2 rounds were much of the same, with Jurus looking to land big shots and Peters continually slamming him to the canvas and working his submissions. At the close of round 3, Peters execution of classic Gracie Jiu Jitsu strategy paid off as he earned a unanimous decision victory over Jurus. The final Scranton MMA fighter of the night was James Cianci. Cianci squared off against tough as nails competitor Pat Paulo. As the opening bell sounded, Cianci and Paulo wasted no time with feeling each other out. Both fighters charged to the center of the ring and began a frenetic exchange of punches and kicks. Following the flurry, they clinched and pummeled across the ring to scramble against the cage for position. In the end Cianci executed an uchi mata sending Paulo to the canvas to use his guard. Paulos guard proved to frustrate Cianci through effective use of hooks but Cianci never wavered and rained down punches and elbows in an attempt to finish Paulo. Near the end of round 1 Paulo acheived the sweep he had been working for but it was to late as the bell sounded shortly after. Round 2 started the same as round 1, a fast exchange followed by a Cianci takedown. As the fighters hit the mat they scramble for position and Cianci superior ground game showed as he slipped to Paulo’s back and secured the rear naked choke for the tap out victory! As the song goes “2 outta 3 aint bad”. 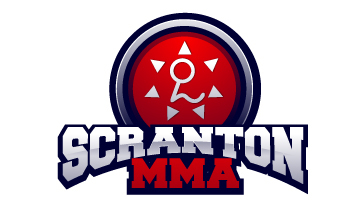 Scranton MMA would like to congratulate these fighters and also give a big “thank you” to all of the coaches, academy members, and families that support them!